Welcome winter: Cold air has arrived, day length has shortened, and you and your chickens are preparing for the months ahead. With the few helpful tips outlined below, winter can be enjoyed by both humans and our feathered friends. As the cold weather settles in for a few months, you may begin to worry about your chickens and how they will handle the change in season. 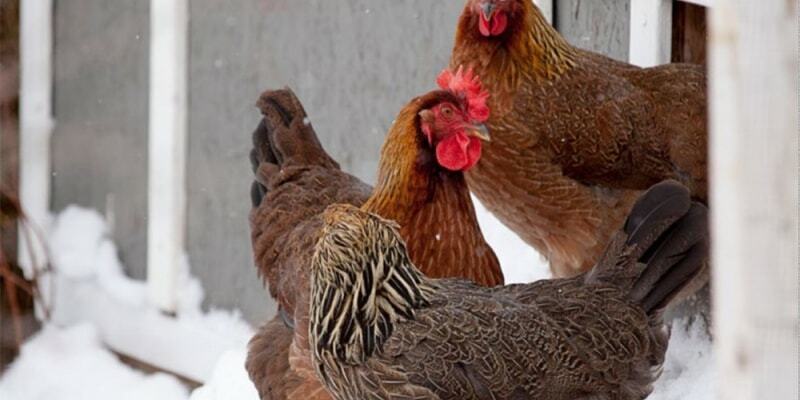 Chickens are remarkably adaptable creatures and can naturally acclimate to cold weather. The internal body temperature of a chicken is much higher than humans—103°F to 105°F vs. 98.6°F. 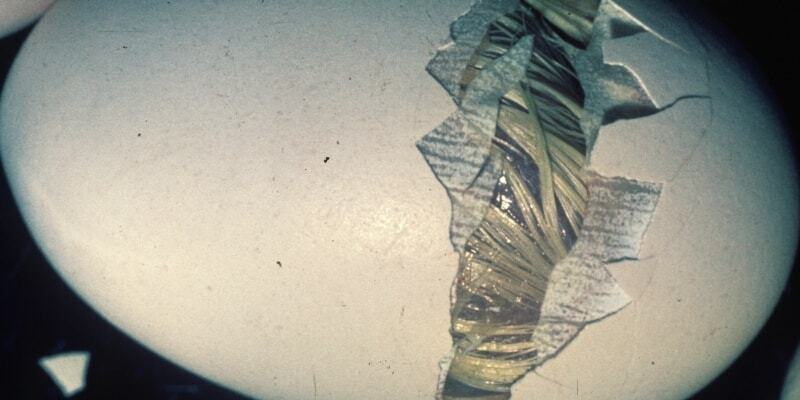 In addition, chickens are equipped with one of nature’s best insulators—the feather. Feathers, like fur, insulate and help maintain proper body temperature by trapping air against the body. This air is then warmed by the higher body temperature of the bird. The more air a chicken can trap, the better insulated the bird will be. This is why many birds will fluff their feathers during periods of cold weather. The action creates more space for air to be trapped against the skin and, subsequently, more insulation against the colder temperatures. Chickens, just like humans, use energy to generate and maintain a consistent internal body temperature. The act of metabolizing feed generates heat and is often the reason why you can expect your chickens to consume more feed during the winter months than during summer. Each gram of protein or carbohydrate consumed will provide four calories. Each gram of fat consumed provides nine calories. This is true for humans, chickens, dogs, and even elephants, too. A 4.5 pound laying hen may generate 10.5 watts of heat per hour. 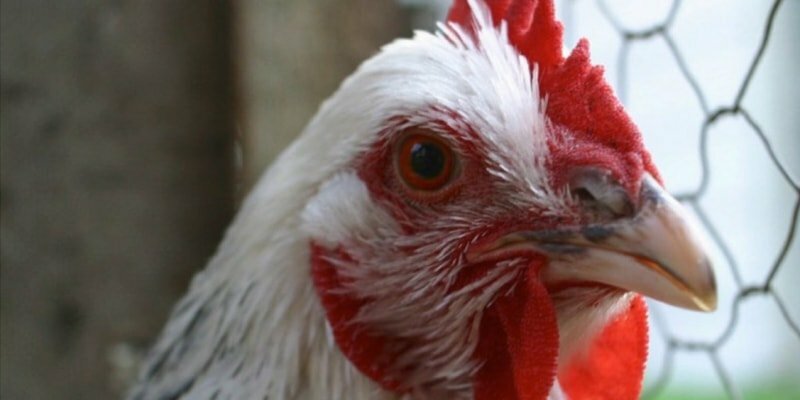 A chicken can produce a surprising amount of heat through metabolism and activity alone. When you factor in the heat generated by the rest of your chickens, a small flock of 10 hens has the potential to produce more heat per hour than a 100 watt light bulb. You can now see why chickens are remarkably adept at thriving in colder temperatures. The amount of heat generated during metabolism is related to the quantity and the quality of feed consumed. A chicken will regulate body temperature to make up for heat loss by internally modifying how quickly she burns fats and carbohydrates for energy. Providing a well-balanced, complete feed to your chickens at all times will allow each bird to consume as much or as little feed as they need to maintain the proper body temperature and stay comfortable based on that day's conditions. Most of us can expect our hens to lay fewer eggs in the winter months, but that does not mean we should change feeding programs or stop providing a complete layer feed. A nutritionally-sound and well-balanced complete feed is always the best option to choose when feeding your hens. Complete feeds contain all of the vitamins and minerals a hen needs to stay healthy and strong during the cold winter months. Do extra calories equal extra comfort? We all think of winter as the perfect opportunity to enjoy our favorite comfort foods, tempting us to provide the same bounty for our chickens. Many times you will hear recommendations for feeding scratch grains and cracked corn to your hens to provide extra calories during the winter months. While scratch grains and corn will provide extra calories, they also contain high levels of carbohydrates. If your hens eat too much scratch or cracked corn, they may not eat enough of the nutritionally-balanced complete feed. So even though the temperature has dropped, it is still a good idea to consider scratch grains and cracked corn as treats and to limit consumption to no more than 10 percent of the total feed intake. Remember, each gram of carbohydrate consumed will provide four calories, but each gram of fat consumed will provide nine calories—125 percent more energy than carbohydrates. Providing access to your complete feed at all times is a better balance of nutrients for your hens. 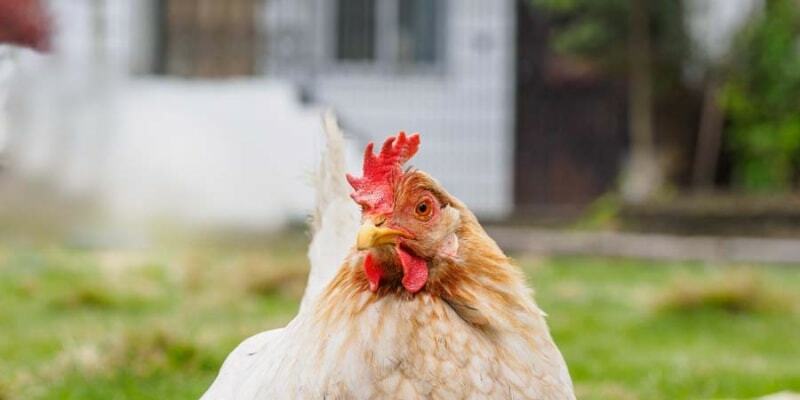 The average hen will eat .25 to .45 pounds of feed per day, meaning that if you are throwing out an entire coffee can full of scratch grains, you may be providing too many treats to your flock—and causing an imbalance in their nutrient intake. Save the scratch grains and cracked corn for winter's coldest days and resist the urge to provide them as an everyday treat. During the cold winter months, we are often tempted to focus on other nutrient requirements and forget about the importance of water. There are six classes of nutrients: protein, carbohydrates, fat, vitamins, minerals, and—perhaps the most important—water. Water is essential for a healthy metabolism as well as maintaining proper body temperature. Since water is such an essential part of the metabolic process, it may help to understand how chickens use—and produce—water during digestion. A chicken may produce 0.14 grams of water for each calorie that she metabolizes. If that hen consumes 300 calories per day, she will produce 42 grams of water. This explains why chicken manure is often 60- to 80-percent moisture. This is an incredible amount of water for one tiny chicken, and one of the reasons why birds need access to fresh—and never frozen—water during the colder months. If one chicken can produce 42 grams of water each day, a small flock of 10 hens can produce 420 grams, or just shy of one pound, of water each day through digestion alone. Additionally, your flock will produce even more water vapor while breathing. Therefore, it is very important to remember to ventilate chicken coops even in the cold winter months. A build-up of moisture inside a chicken house has a number of negative health consequences including respiratory disease, increased prevalence of frost bite, and ammonia gas build-up. Keep a window cracked or your access door open during the daylight hours so the water vapor has a chance to dissipate and fresh air can enter your coop. Cold dry air is always better for your flock than cold moist air. Managing water in the winter can be a challenge, but it is necessary in order to maintain a healthy and active flock. Make sure a fresh source of water is available to your hens during the hours they are awake and active. For example, if your hens are on a natural light cycle, make sure you have water available during all daylight hours. If you do not have electricity in your chicken house, it is okay to empty or bring your waterer inside during the night so the water does not freeze. Just make sure you put fresh water back in the coop in the morning for your hens. On very cold days, you may need to replace your water multiple times to keep it from freezing. While we may be tempted to worry about our flocks during the winter months, remember that chickens are incredibly adaptable creatures, conveniently covered in one of nature’s best insulators. They will thrive and do well in cold weather if given a safe place to live, a nutritionally-balanced feed, plenty of water, and the opportunity to adapt to the dropping temperatures. If your hens are active, eating well, and look healthy, then they are likely content and have adjusted well to the change in season. Enjoy! Nancy Buchanan Jefferson is part of the nutrition and technical services team at Kalmbach Feeds. She received her PhD from West Virginia University in 2008, then worked in the feed industry for five years before joining Kalmbach Feeds in May of 2013. She currently lives on a farm in Gallia County, Ohio with her husband John and enjoys working with her animals and spending time with her family.